Thanks to Regional Development Australia and Netstripes Bizruption is Going West! Bizruption has been bringing entrepreneurs, key influencers and investors together from all over NSW to collaborate, innovate and grow their businesses in this digital age. And for the first time, Bizruption is going west! 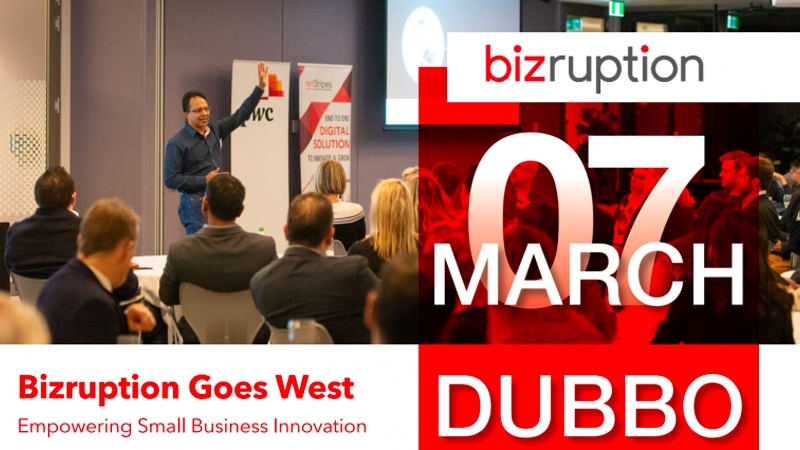 Bizruption is a free networking event on innovation for small businesses, startups and investors. This meetup will help you - as a small business owner, drive and be one step ahead of the disruption in your industry. If you’re from Western New South Wales, we invite you to join us on Thursday 7th March 2019 at Dubbo. We know and understand the challenges of starting and running a business. So come share your story, get inspired and be a part of a movement that will connect you to a community of other like-minded people. Don’t forget to come ready with lots of business cards, and bring your friends too! · Have fun, win prizes and, enjoy some wine and nibbles. Digital Marketing & Technology Services companies attending: A $250 nominal fee per attendee will be charged to help in paying for actual cost of the event. Your contribution will help us conduct this event for SME owners to improve innovatikon and digital engagement. For sponsorship opportunities and more information, please contact us at bc@netstripes.com. Bizruption is brought to you by Netstripes.